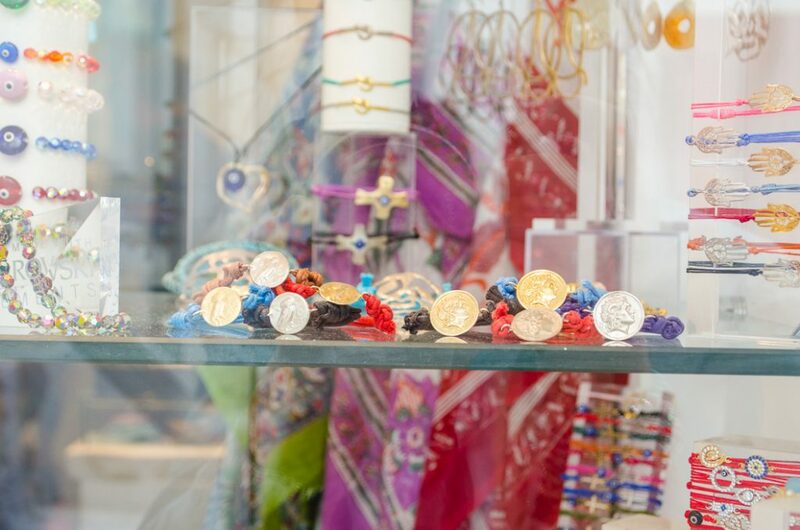 One of the most popular Greek souvenirs you’ll see in the shops of Mykonos is the evil eye. Here’s why you might want to buy one. The evil eye is a special symbol in Greece and for many cultures. In Greece, it typically comes in the form of blue eye. It is so prevalent in the culture here that throughout the mainland and on the islands – like Mykonos – it has become a popular souvenir. You can buy beautiful and creative artwork, wall decorations and all kinds of lovely jewelry with the evil eye as the main design. There’s a reason to have this eye close to you. Called the mati, the evil eye is a kind of superstition brought upon someone by a person who is envious or jealous. For example, if someone gives you the evil eye, you may feel sick or low. May people say they get headaches due to someone casting the evil eye on them. Still don’t get it? Perhaps someone complements you on your perfect and then the next thing you know you have a huge pimple on your nose. Greeks would tell you it was the evil eye. Greeks will also tell you ways to prevent the evil eye. You need to wear these blue eye charms and beads to “reflect” any evil away! 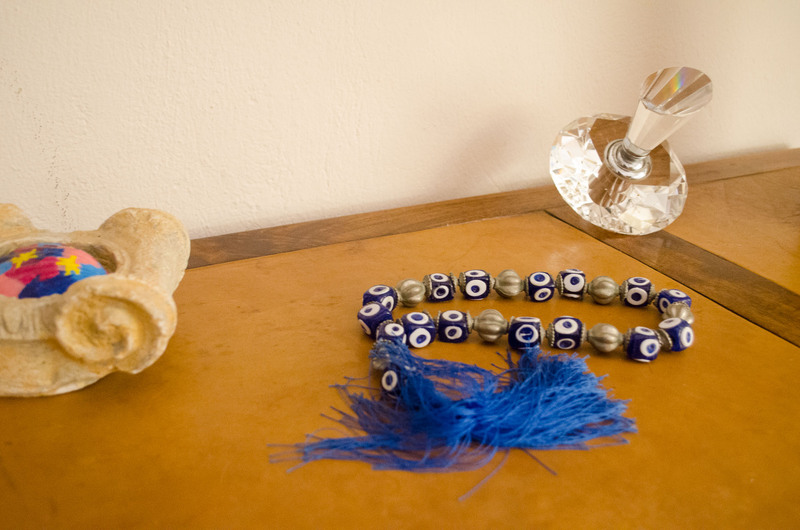 Greeks who believe in the evil eye prepare themselves by wearing blue eye charms or blue beads to reflect the evil. Some even believe that an expert in xematiasma can recite a special prayer to release the negative effects of the evil eye. During ancient Greece, Alexander the Great spread the idea of the evil eye across his empire. But the idea of the evil eye was first noted 5,000 years ago on clay tablets in Mesopotamia. It’s not just Greeks who believe in the evil eye. It also exists in some form in the Jewish, Christian, Muslim, Buddhist and Hindu cultures. The idea of the evil eye didn’t carry over to America, except as a metaphor. 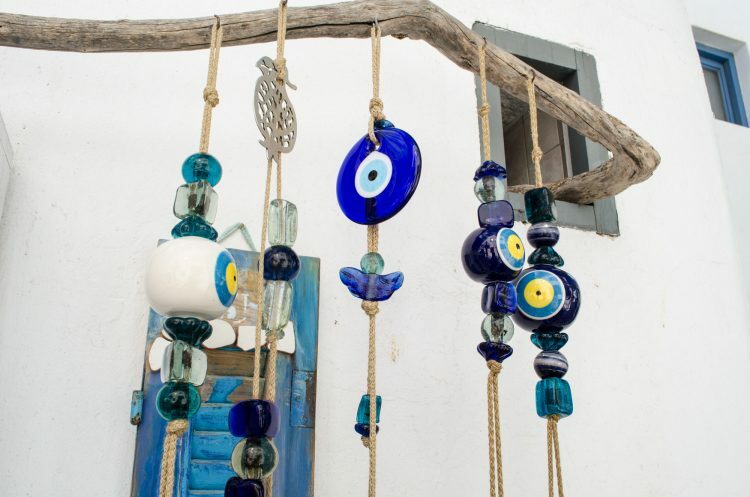 While you are browsing the shops on Mykonos for a unique and interesting gift for yourself or your friends and family back home, why not consider buying something with an evil eye. There are many stylish designs in the form of bracelets for both men and women. There are beautiful necklaces for women too. You can find them in gold, silver, rose gold and more simpler materials. Some are made with precious stones too. There are also beaded trinkets and keychains to check out. Have you ever heard of the evil eye in Greece?